Milarepa. 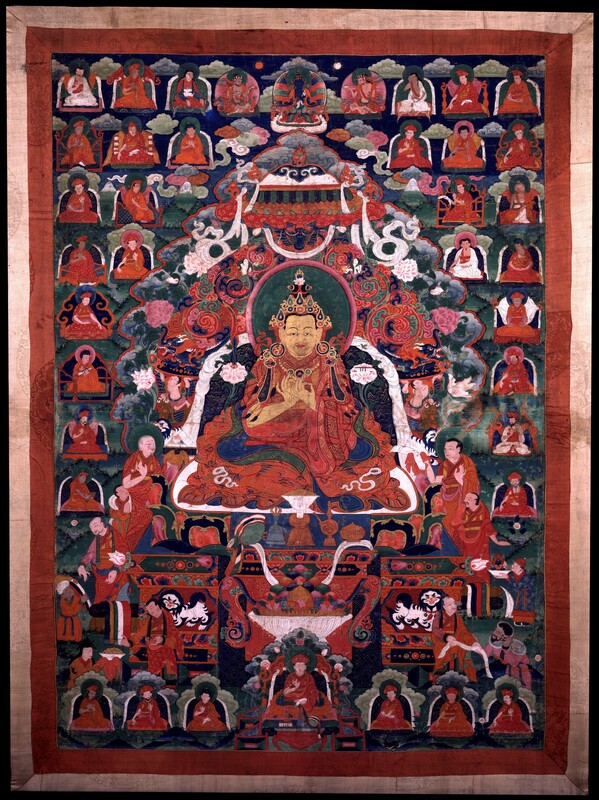 Image credit: himalayanart.org. Click on image to enlarge. Milarepa (mi la ras pa) is one of the most famous individuals in the Tibetan Buddhist tradition, but very little of his life is known with any historical certainty. Even the dates of his birth and death have been notoriously difficult to calculate. 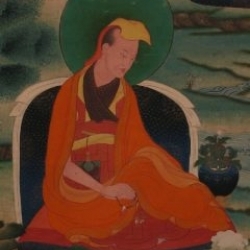 Tsangnyon Heruka (gtsang smyon heruka, 1452-1507) – Milarepa’s most famous biographer – records that the boy was born in a water-dragon year (1052) and passed away in a wood-hare year (1135), dates also found in biographical works from a century earlier. Numerous other sources, including the important mid-fifteenth-century Religious History of Lhorong (lho rong chos ‘byung) push back the dates one twelve-year cycle to 1040-1123, a life span widely accepted by modern scholars. A number of prominent Tibetan historians, including Katok Tsewang Norbu (kaH thog tshe dbang nor bu, 1698-1755), Situ Panchen Chokyi Jungne (si tu paN chen chos kyi ‘byung gnas, 1700-1774), and Drakar Chokyi Wangchuk (brag dkar chos kyi dbang phyug, 1775-1837), however, place Milarepa’s birth in 1028. Still other sources place his birth as early as 1026 or 1024. He is usually said to have lived until his eighty-forth year, although sources again record variant life spans of 73, 82, or 88 years. 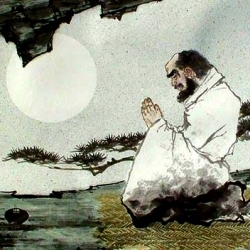 In any case, it is clear that he lived during the eleventh and early-twelfth centuries, at the advent of the latter dissemination (phyi dar) of Buddhism in Tibet. A statue of Milarepa. 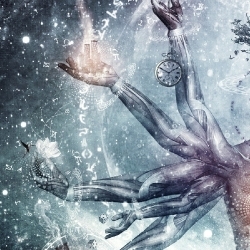 Image credit: himalayan.art.org. Click on image to enlarge. According to Tsangnyon Heruka’s account, Milarepa‘s ancestors were nomads of the Khyungpo (khyung po) clan from the northern region of the “central horn,” (dbus ru) one of two administrative regions of Tibet’s central province (dbus). 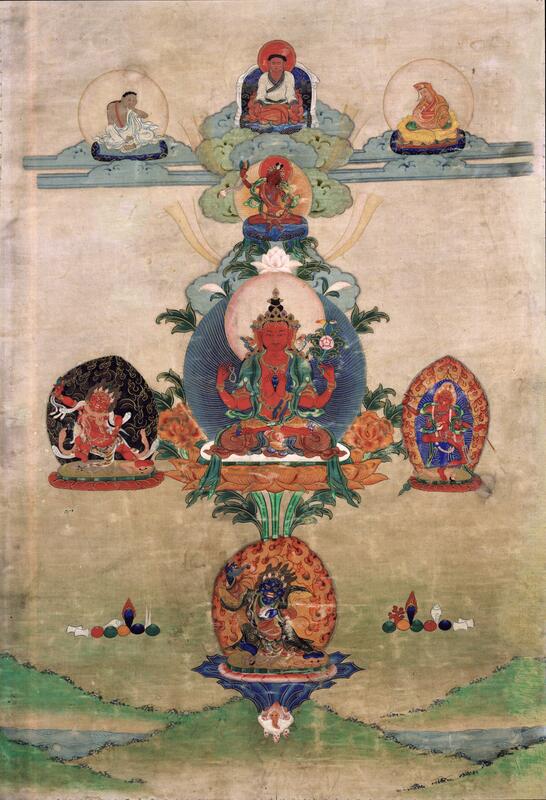 One early ancestor was a Nyingma tantric practitioner named Josey (jo sras). Khyung po Josey became famous for his exorcism rites, a practice that earned him both respect and a good deal of wealth. While residing in a place called Chungpachi (gcung pa spyi) in the region of Lato Jang (la stod byang), he had an encounter with a particularly fierce spirit and at last caused the demon to cry out in horror “mila, mila (mi la),” an admission of submission and defeat. Josey subsequently adopted this exclamation as a new clan title and his descendents came to be known by the name Mila. Khyungpo Jose eventually married and had a son. 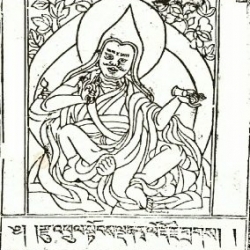 This son in turn had two sons, the elder of whom was known as Mila Doton Sengge (mi la mdo ston seng ge). 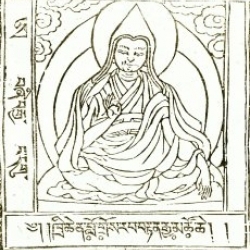 The latter’s son was named Mila Dorje Sengge (mi la rdo rje seng ge). Dorje Sengge, who was fond of gambling, lost his family’s home and wealth in a fateful game of dice. The family was thus forced to seek out a new life elsewhere and eventually resettled in the small village of Kyangatsa (skya rnga rtsa) in Mangyul Gungtang (mang yul gung thang), close to the modern border of Nepal. 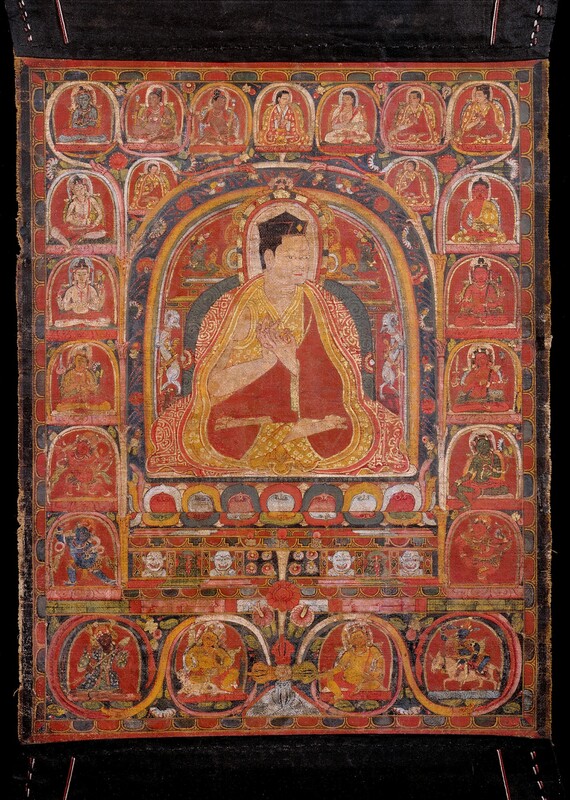 The father Doton Sengge served as a local village priest, performing various rituals and religious activities, while the son undertook trading trips in Tibet and to Nepal. In this way they were able to regain a good deal of wealth. Dorje Sengge married a local woman and had a son they named Mila Sherab Gyeltsen (shes rab rgyal mtshan); the latter in turn married a woman named Nyangtsa Kargyen (myang rtsa dkar rgyan). This couple then gave birth to the boy who would become Milarepa. 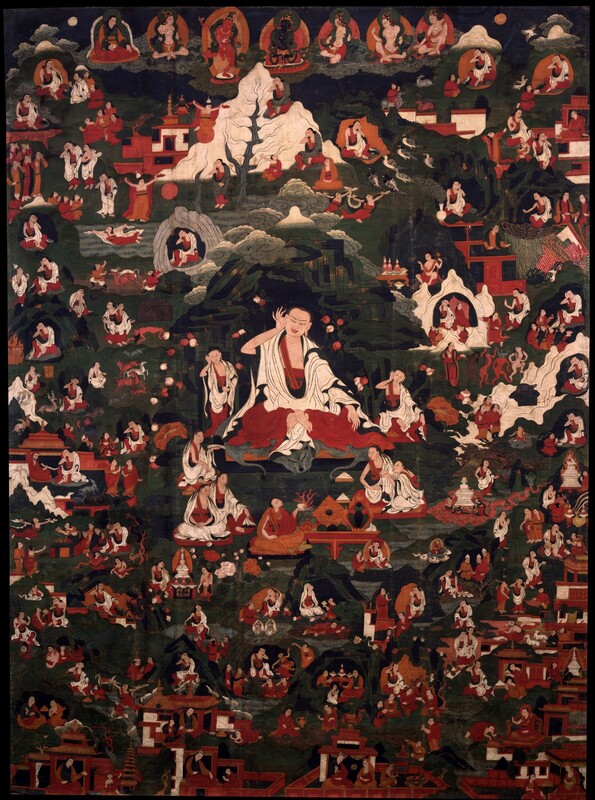 Milarepa, the great poet yogi of Tibet surrounded by life story vignettes. 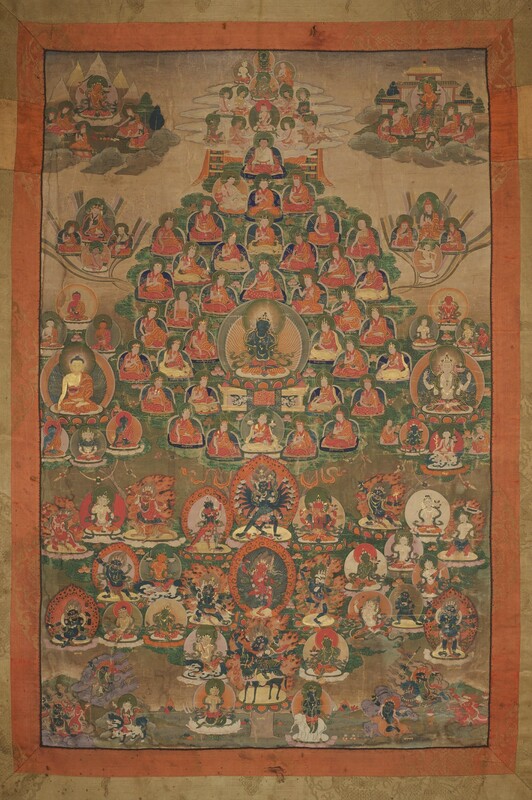 Image credit: himalayanart.org. Click on image to enlarge. 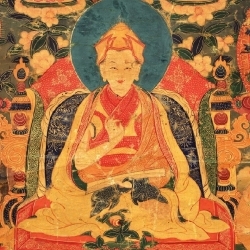 Upon hearing the news of his child’s birth, Mila Sherab Gyeltsen is said to have exclaimed, “I am delighted to hear the news that the child has been born a son,” and so the boy was named Topaga, literally “delightful to hear.” He later proved to have a pleasing voice and so lived up to this name. Several years later, his sister Peta Gonkyi was born and eventually Milarepa was betrothed to a local village girl named Dzese. When the boy turned seven, his father was stricken with a fatal illness and prepared a final testament that entrusted his wife, children, and wealth to the care of Milarepa’s paternal uncle and aunt, providing that Milarepa regain his patrimony once he reached adulthood. 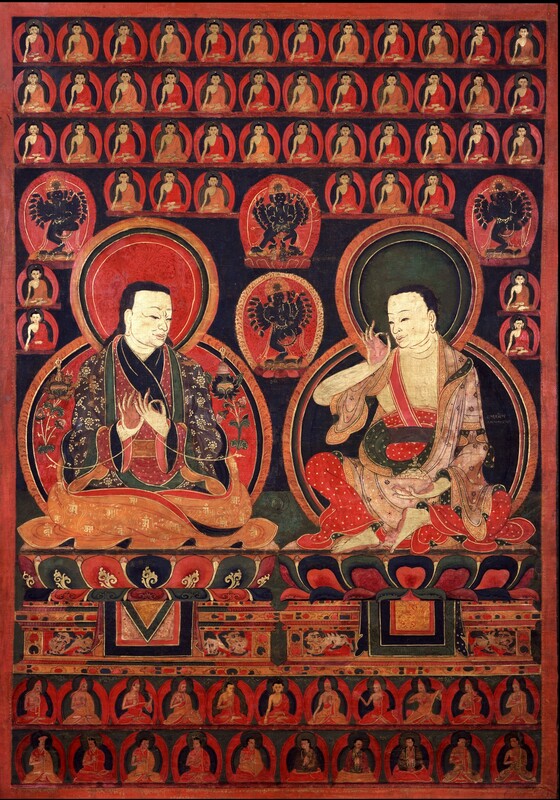 The uncle and aunt, usually depicted as greedy and cold-hearted, responded by taking the estate for themselves, thus casting Milarepa’s family into a life of abject poverty. In at least one version of the life story, by the fourteenth-century author Yungton Zhije Ripa (g.yung ston zhi byed ri pa), the relatives’ actions are partially justified, noting that local marriage customs dictated that following Sherab Gyeltsen’s death, the estate should have rightfully remained within the family of his brother, i.e. Milarepa’s paternal uncle. 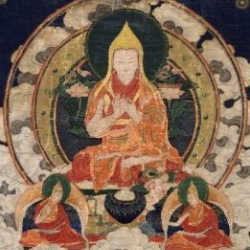 In any case, the boy was sent to study reading and writing with a Nyingma master while his mother and sister were forced to labor as servants for their uncle and aunt. 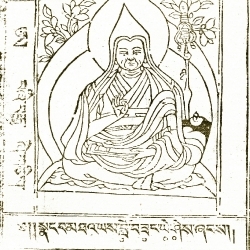 Marpa Chokyi Lodro. Image credit: himalayanart.org. Click on image to enlarge. 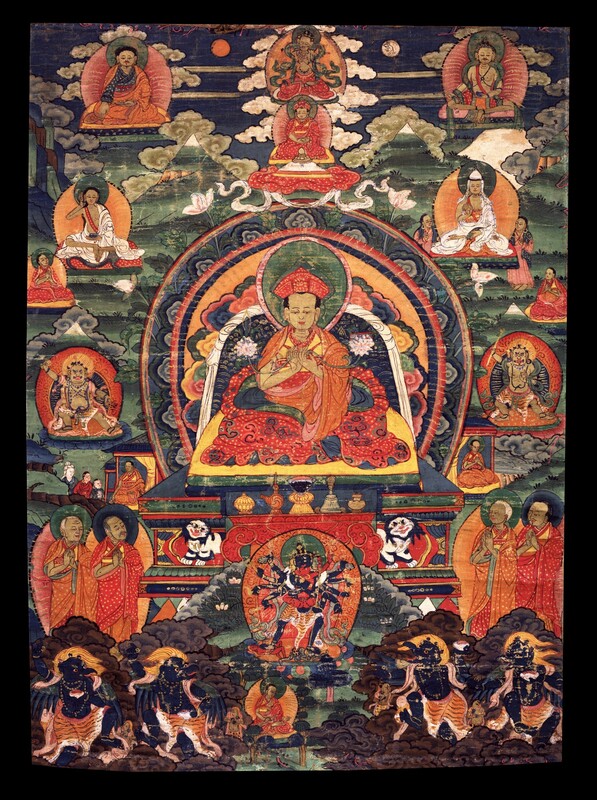 Nyangtsa Kargyen then sent her son to train in black magic in order to seek revenge upon their relatives. 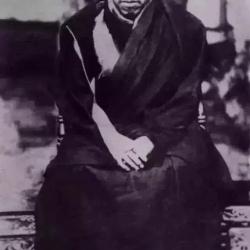 Carrying out his mother’s wishes, he trained in black magic with Nubchung Yonten Gyatso (gnubs chung yon tan rgya mtsho) and thereby murdered thirty-five people attending a wedding feast at his aunt and uncle’s house. From Yungton Trogyal (g.yung ston khro rgyal) he then learned the art of casting hailstorms. Unleashing a powerful storm across his homeland, he destroyed the village’s barley crops just as they were about to be reaped, washing away much of the surrounding countryside. Milarepa eventually came to regret his terrible crimes and in order to expiate their karmic effects he set out to train with a Buddhist master. 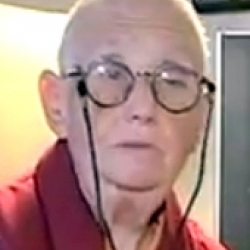 He first studied Dzogchen (rdzogs chen) with Rangton Lhaga (rang ston lha dga’) in Nyangto Rinang (myang stod ri nang). His practice, however, proved ineffective, and Rangton instead directed Milarepa to seek out Marpa Chokyi Lodro (mar pa chos kyi blo gros, 1002/1012-1097), the great translator residing in Lhodrak (lho brag) in southern Tibet. Marpa Chokyi Lodro, the Translator: the founder of the Kagyu School of Tibetan Buddhism. 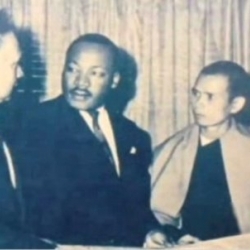 At the right is Milarepa Gyepa Dorje, the most famous student of Marpa and greatest poet yogi of Tibet. Image credit: himalayanart.org. Click on image to enlarge. 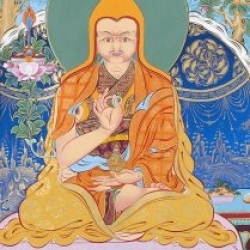 Milarepa eventually reached Lhodrak where he met a heavyset plowman standing in his field. 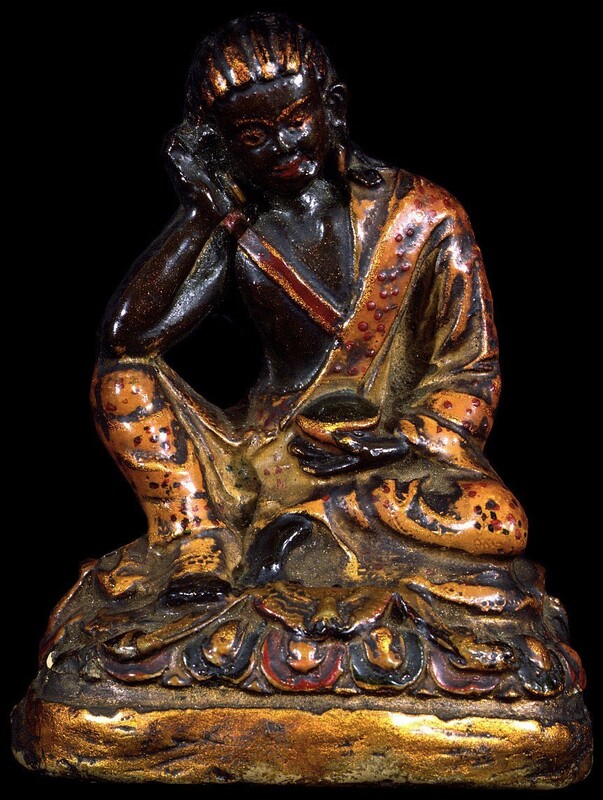 In reality, this was Marpa who had had a vision that Milarepa would become his foremost disciple. He had thus devised a way to greet his future student in disguise. 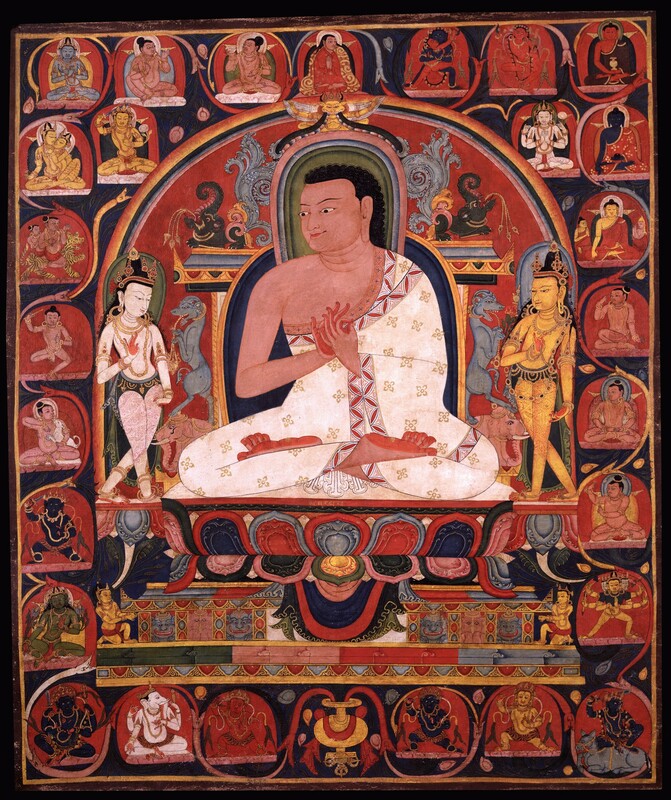 Marpa was famous for his fierce temper and did not immediately teach Milarepa. Instead, he subjected his new disciple to a stream of verbal and physical abuse, forcing Milarepa to endure a series of ordeals, including a trial of constructing a series of four immense stone towers. 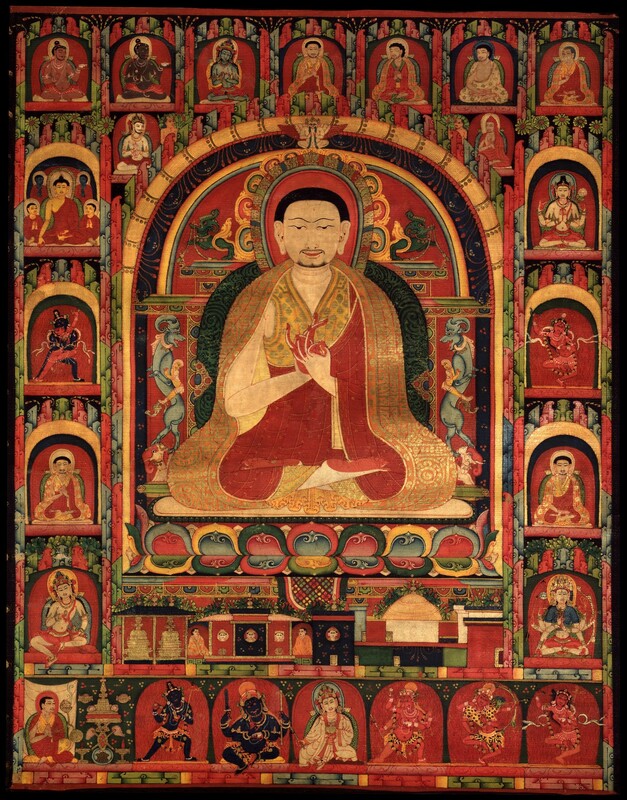 Marpa eventually revealed that Milarepa had been prophesied by his own guru, the Indian master Naropa. He further explained that the trials were actually a means of purifying the sins he had committed earlier in his life. The tower still stands at the center of Sekhar Gutok Monastery. 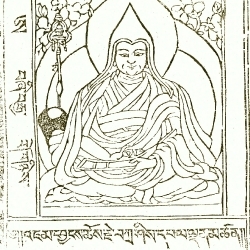 Marpa first imparted the lay and bodhisattva vows, granting Milarepa the name Dorje Gyeltsen (rdo rje rgyal mtshan). 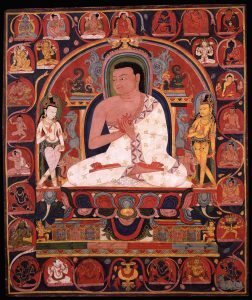 Milarepa then received numerous tantric instructions that Marpa had received in India, especially those of tummo (gtum mo), or yogic heat, the aural instructions (snyan rgyud) of tantric practice, and instructions Mahamudra. 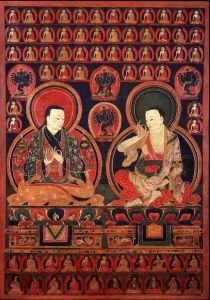 Marpa conferred upon Milarepa the secret initiation name Zhepa Dorje (bzhad pa rdo rje) and commanded him to spend the rest of his life meditating in solitary mountain retreat. Milarepa: the great poet yogi of Tibet surrounded by life story vignettes. Image credit: himalayanart.org. Click on image to enlarge. Milarepa returned to his homeland for a brief period and then retired to a series of retreats nearby. Most famous among these is Drakar Taso (brag dkar rta so) where he remained for many years in arduous meditation. With nothing but wild nettles to eat, his body grew weak and his flesh turned pale green. He later traveled widely across the Himalayan borderlands of southern Tibet and northern Nepal, and dozens of locations associated with his life have become important pilgrimage sites and retreat centers. 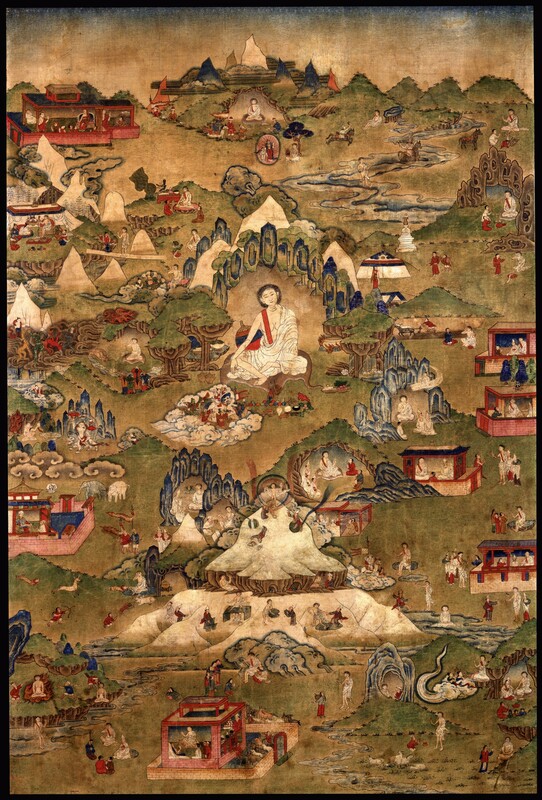 In his account of the life story, Tsangnyon Heruka drew largely upon earlier sources in order to document dozens such locations, but he reorganized them to create a new map of sacred sites—many of which were designated “fortresses” of meditation—along Tibet’s southern border: six well-known outer fortresses, six unknown inner fortresses, and six secret fortresses, together with numerous other caves. Stories of Milarepa’s taming and converting demons in these locations, recorded in Tsangnyon Heruka’s companion volume The Hundred Thousand Songs of Milarepa (mi la ras pa’i mgur ‘bum) echo accounts of the eight-century Indian master Padmasambhava. Many of Milarepa’s most famous retreat locations were said to have been previously inhabited by Padmasambhava himself. Tsangnyon Heruka’s reckoning of Milarepa’s meditation sites therefore reveals a process of spiritual re-colonization, one that effectively claimed much of the Himalayan border for Milarepa’s lineage. Three famous sacred sites of southern and western Tibet – Tsari (tsA ri), Labchi (la phyi), and Kailasa (ti se) – are said to have been established or prophesied by Milarepa, and all three later became important Kagyu retreat and pilgrimage centers, identified as Himalaya/Himavat, Godavari, and Caritra/Devikota from the list of twenty-four pithas of the Cakrasamvara Tantra, as well as the mandalas of Cakrasamvara‘s body, speech, and mind. 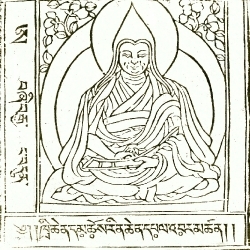 Drakar Taso became an important monastic institution and printing house under the direction of Tsangnyon Heruka’s disciple Lhatsun Rinchen Namgyel (lha btsun rin chen rnam rgyal, 1473-1557). I bow down at the feet of most excellent Marpa. Bless this beggar to turn from clinging to things. Alas. Alas. Ay me. Ay me. How sad. I reflect and reflect and again and again I despair. They engage and engage and stir up from their depths so much torment. They whirl and they whirl and are cast in the depths of life’s round. What to do? What to do? There’s no cure but the dharma. Bless this beggar to stay in mountain retreat. A restless visitor to these ruins is afflicted with anguish. Are nowadays taken over by harmful spirits. Examples that call me, a yogin, to practice. Nowadays resembles a lion’s upper jaw. Nowadays is a tangle of weeds. Nowadays rise up as an army of foes. Nowadays, of him no trace remains. Nowadays is a pile of bare bones. Nowadays works as a servant. Nowadays serves as a nest for vermin and birds. Nowadays lives among hostile enemies. Has vanished without leaving a trace. I address my prayers to the lord lama’s body. The aims of this yogin will be complete. Be cast for the benefit of beings. When cast, my aims are fulfilled. 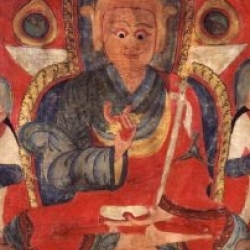 Milarepa, principal student to Marpa the translator, teacher of Rechungpa and Gampopa. Image credit: himalayanart.org. Click on image to enlarge. Milarepa passed away at the age of 84, after eating poisoned curds given by the jealous geshe Tsakpuwa (rtsag phu ba). 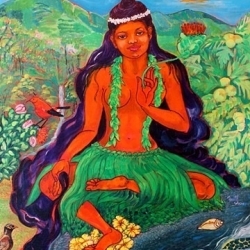 After Milarepa’s body was cremated, dakini goddesses are said to have carried away his corporeal relics, leaving his disciples with little more than a piece of his robe, a lump of rock sugar, a knife and flint steel, and the yogin’s many songs of inner realization. 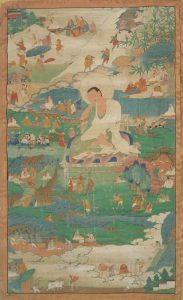 Milarepa is credited with gathering numerous disciples; the best known are Rechung Dorje Drakpa (ras chung rdo rje brag pa, 1084-1161) and Gampopa Sonam Rinchen (sgam po pa bsod nam rin chen, 1079-1153). 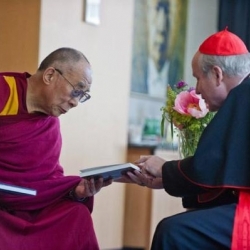 The latter helped to establish a lineage of Kagyu masters and institutions that continue to play an important role in the dissemination of Tibetan Buddhism. KARMA KAGYU REFUGE FIELD. 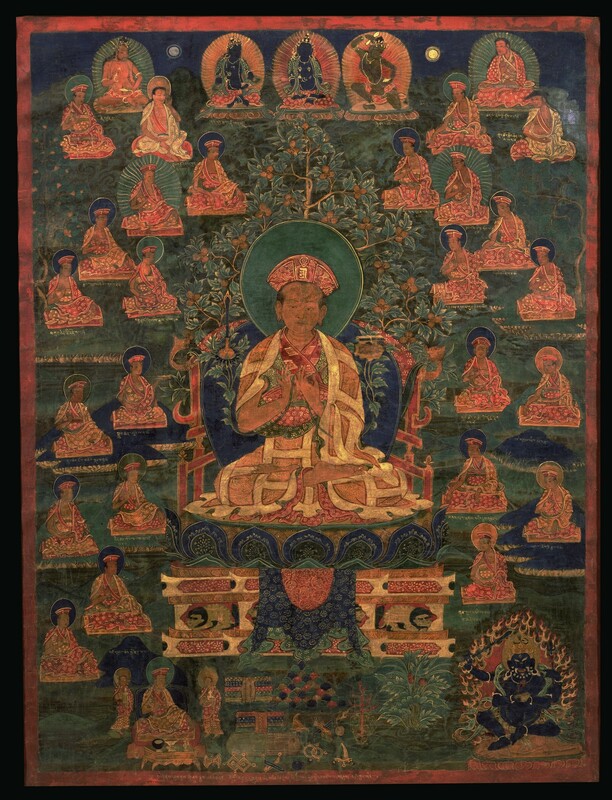 Karma Kagyu Field of Accumulation painting with the Fifteenth Karmapa, Kakyab Dorje, as the last lineage holder at the time of the compositions creation. More at himalayanart.org. Aufschnaiter, Peter. 1976. “Lands and Places of Milarepa.” East and West 26, no. 1-2: 175-89. 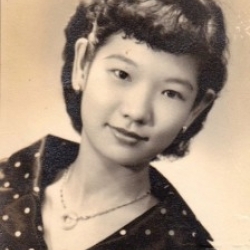 Chang, Garma C. C. 1962. The Hundred Thousand Songs of Milarepa. New Hyde Park, N.Y.: University Books. Reprint, (2 vols. in 1), Boston: Shambhala Publications, 1999. Kunga Rinpoche, and Brian Cutillo. 1978. Drinking the Mountain Stream. Translated by Kunga Rinpoche and Brian Cutillo. Novato, CA: Lotsawa Press. Kunga Rinpoche, and Brian Cutillo. 1986. Miraculous Journey. Translated by Kunga Rinpoche and Brian Cutillo. Novato, CA: Lotsawa Publications. Martin, Dan. 1982. 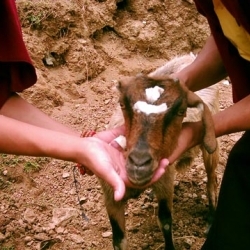 “The Early Education of Milarepa.” The Journal of the Tibet Society 2: 53-76. Quintman, Andrew. 2008. 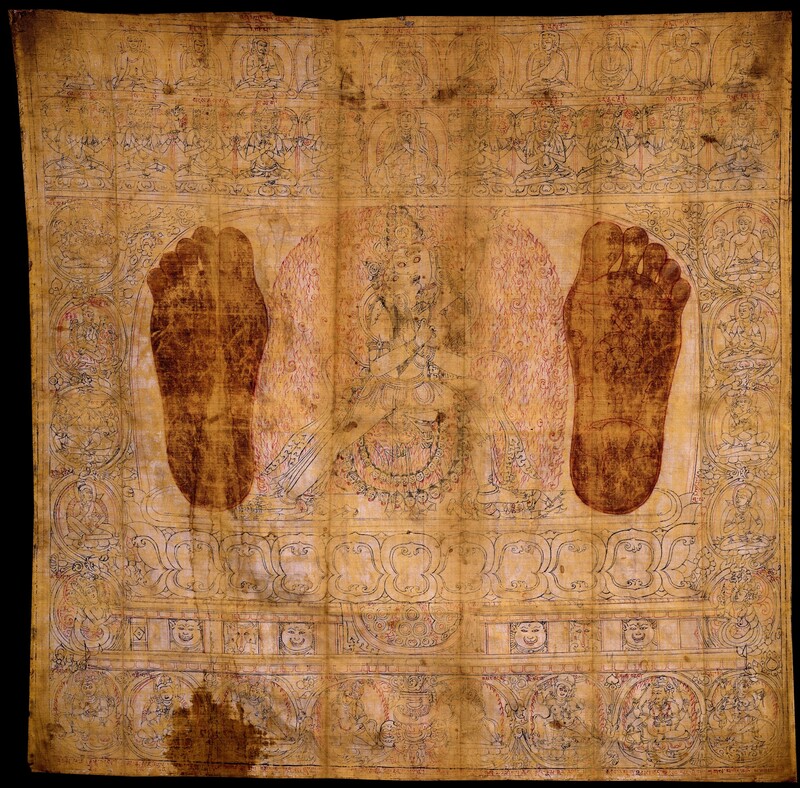 “Toward a Geographic Biography: Milarepa’s Life in the Tibetan Landscape.” Numen 55, no. 4: 363-410. Quintman, Andrew. 2013. “Wrinkles in Time: On the Problem of Mi la ras pa’s Dates.” Acta Orientalia 74: 3–26. Schaeffer, Kurtis R. 2007. “Dying Like Milarepa: Death Accounts in a Tibetan Hagiographic Tradition.” In The Buddhist Dead: Practices, Discourses, Representations, edited by Bryan J. Cuevas and Jacqueline I. Stone, 208-33. Honolulu: University of Hawaii Press. Schmid, Toni. 1927-1935. 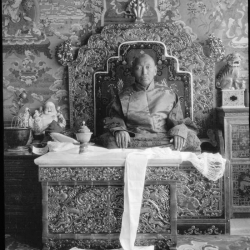 The Cotton-Clad Mila: The Tibetan Poet-Saint’s Life in Pictures, Sino-Sweding Expedition, Pub. 36. Stockholm: Statens etnografiska museum, 1952. Sernesi, Marta. 2004. “Milarepa’s Six Secret Songs: The Early Transmission of the Bde-Mchog Snyan Brgyud.” East and West 54, no. 1-4: 251-87. Source: Andrew Quintman, “Milarepa,” Treasury of Lives, accessed July 20, 2018, http://treasuryoflives.org/biographies/view/Milarepa/3178. 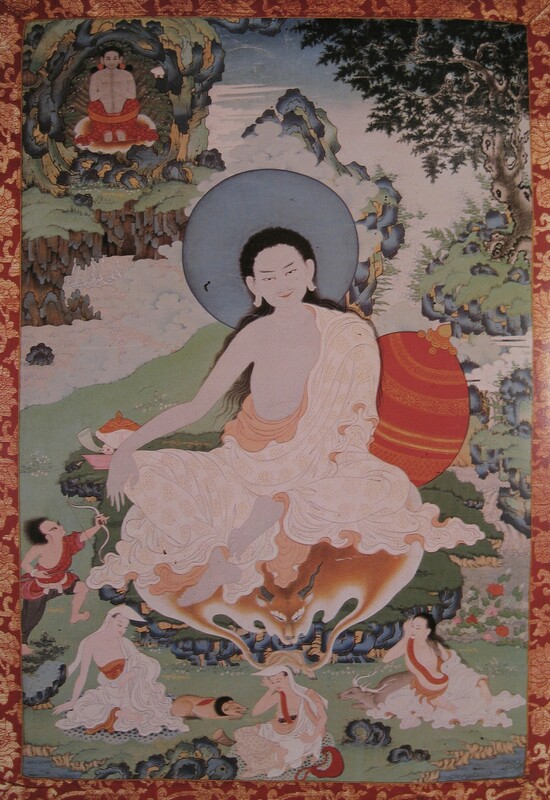 Source: https://treasuryoflives.org/biographies/view/Milarepa/3178. Click on image to enlarge. Is it the guru’s fault? Dorje Sengge married a local woman and had a son they named Mila Sherab Gyeltsen (shes rab rgyal mtshan); the latter in turn married a woman named Nyangtsa Kargyen . This couple then gave birth to the boy who would become Milarepa. 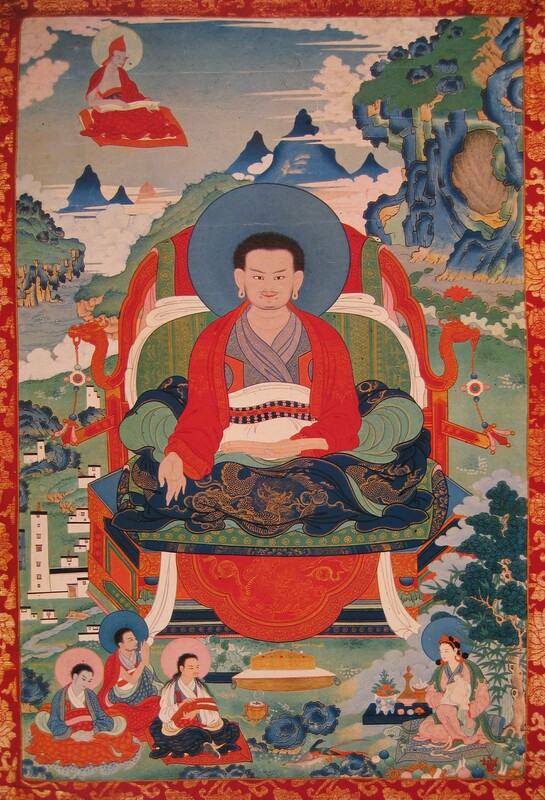 Marpa first imparted the lay and bodhisattva vows, granting Milarepa the name Dorje Gyeltsen. Milarepa then received numerous tantric instructions that Marpa had received in India, especially those of tummo (gtum mo), or yogic heat, the aural instructions (snyan rgyud) of tantric practice, and instructions Mahamudra. Marpa conferred upon Milarepa the secret initiation name Zhepa Dorje (and commanded him to spend the rest of his life meditating in solitary mountain retreat.Milarepa spent the rest of his adult life practicing meditation in seclusion and teaching groups of disciples mainly through spontaneous songs of realization . Milarepa was born in western Tibet to a wealthy family. Due to the hush treatment his family gone after his father passing by his greedy uncle. Milarepa sought revenge by studying black magic in his younger years on a wicked uncle, killing many people. 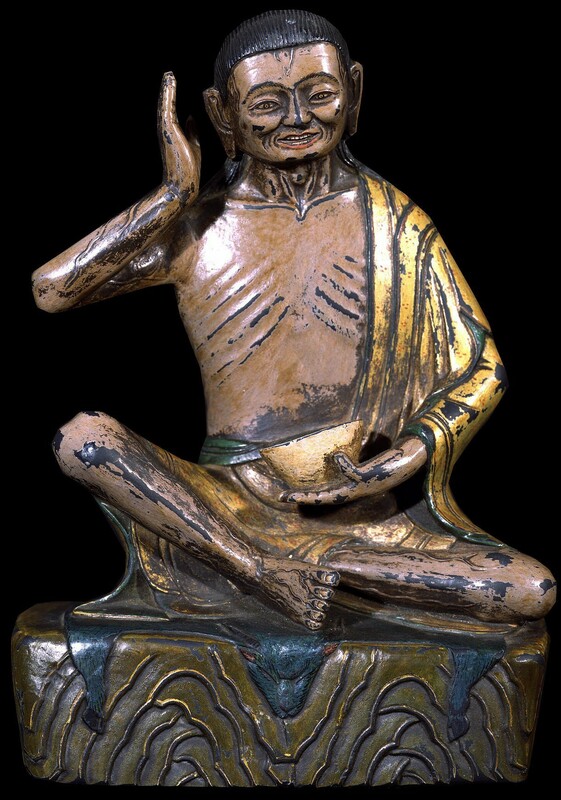 Feeling sorrow about his deeds , he later became student of Marpa the translator and practice solitary meditation in caves and mountain retreats. He then turned to Buddhism to become an accomplished yogi despite his past as a murderer. After many years of practice , he lived as a fully realized yogi, and eventually even forgave his aunt, who caused the misfortune of his family. 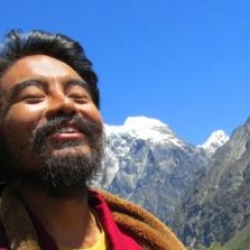 He began his simple, solitary lifestyle, living in caves, travelling widely across the Himalayan borderlands of Tibet and He spent the rest of his life practicing meditation. Areas which were associated with his life have become an important pilgrimage sites till today. He was one of the most famous Tibetan Buddhist masters, yogi saints and poets who was well remembered for his determination .